My tattoos are full of vibrant colors and sparkles, they are tender, very feminine, beautiful and sometimes funny. My style can be clearly seen a mixture of Japanese kawaii culture, referring to the magical girls and the Mexican culture, which reflects my personality and is instantly recognizable everywhere. 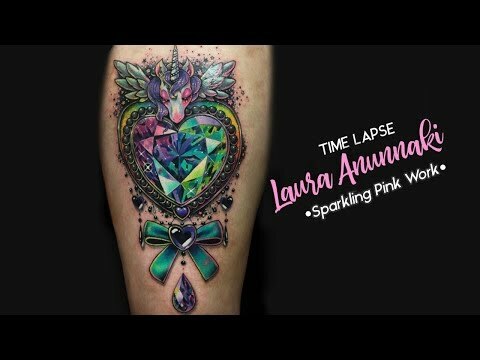 I am Mexican tattoo artist known around the world for my peculiar tattoos full of glitter and bright colors. I am a self-taught artist and started my career as a tattoo artist in 2015 but have been an artist since a very young age. I always had a huge love for tattoo, actually I came into the tattoo world getting tattooed like most people, but I had a problem. Due to my personality and my interior artist I had demands that the tattoo industry could not satisfy, so I started to design tattoos for myself and my friends, and this is how I started to get support for my learning from some tattoo artists and then I earned a place in the industry. I studied Graphic Design at the National Autonomous University of Mexico, I am an illustrator, currently designer and co-owner of Laura KiraKira. Laura KiraKira is a brand of lifestyle where I express my art in different products. My tattoos are full of vibrant colors and sparkles, they are tender, very feminine, beautiful and sometimes funny. My style can be clearly seen a mixture of Japanese kawaii culture, referring to the magical girls and the Mexican culture, where all those colors come from, a touch of brightness, feminine and powerful characters, precious stones, light effects and fantastic elements, including several techniques and tattoo styles that result in a very unique and distinctive style, reflect of my personality and that is instantly recognizable everywhere. You can always see that my style continues to evolve over time, continually improving my style, but my personal stamp remains intact. I do not want to feel stocked and I want to push myself every day to give the best of me to people who trust their bodies. I like to travel a lot, since 2016 I have traveled around the world attending numerous tattoo conventions and some of the most prestigious international tattoo shows in the industry in Europe, Asia and South America mainly. I love to learn new things from each place and the artists I met. I have also collaborated with many tattoo studios around the world, and currently works in Japan, Taiwan, Spain, Mexico, France and England.